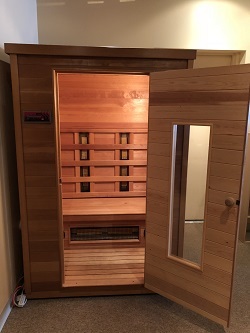 A sauna utilizing infrared heat energy instead of hot air or steam. Far-infrared heat burners produce radiant energy just like the sun (without the potentially harmful UV light). These penetrate your skin up to 1.5″ causing your core body temperature to rise resulting in increased sweating (2-3 times as much as a traditional sauna) and your heart rate to increase (a no-exercise aerobic workout) at a much lower temperature (110-130° F) than a traditional sauna (180-235° F). It can be used alone or part of our detoxification programs. Elimination of toxins, aerobic benefits of burning 600-900 calories in just 30 minutes, relief of back and arthritic pain, relief of muscle tightness, improved blood flow, improved skin tone, improved immune function, and weight loss. Do you think the infrared sauna might be right for you? Call our Clearwater Chiropractic office today to make an appointment.